We look back at some of the cosiest and most envy-inducing homes we visited this 2015. 1. Matthew and Mark's stunning and eclectic shophouse on Everton Road. What was once a sausage factory and photo studio was transformed into a stunning residence that features an outdoor shower, a spacious kitchen counter, and an authentic Rajasthan door. Cost of renovation: $65,000. Click here to see more of this shophouse. 2. Tim and Kristine's retro-industrial BTO flat in Bukit Panjang. The Wongs’ family home features a mix of industrial elements (e.g., brick walls) and vintage or recycled furniture and furnishings. The no-fuss open plan layout and practical furniture, topped off with quirky and sentimental knick knacks, make the place truly homey. Click here to see more of this flat. 3. Sophia and Maqiyin's dreamy Ikea-filled HDB flat in Punggol. This home is a mix of Scandinavian, minimalist, and industrial, punctuated with scores of charming accents and DIY projects that give the space its cheerful vibe. And it's "95 percent Ikea," Sophia said. Cost of renovation: $40,000. 4. Sahala and Lena's romantic shabby-chic home in Tanah Merah. Fabulous vintage finds and distressed furniture in shabby-chic country style fill this condominium unit in Tanah Merah. A stellar piece of work in this home is found in their kids' bedroom: a treehouse bed with hidden storage under the stairs. Cost of renovation: $70,000. 5. John and Justina's colour-filled and kid-friendly Bishan flat. In this 125 square metre family home, one finds the perfect balance between chic decors and kid-friendly furnishings. Unabashed use of colours vivifies the entire space and keeps the kids at home happy and entertained. Cost of renovation: $15,000 (first renovation) and $50,000 (second renovation). 6. Alf and Evelyn's colourful and cheerful HDB flat in Bishan. Here is another home which greatly employed colours to boost the personality of the space. The couple also had their walls knocked down to create a breezy and open-plan layout and even converted one bedroom into a work and study space. Cost of renovation: Over $50,000. 7. 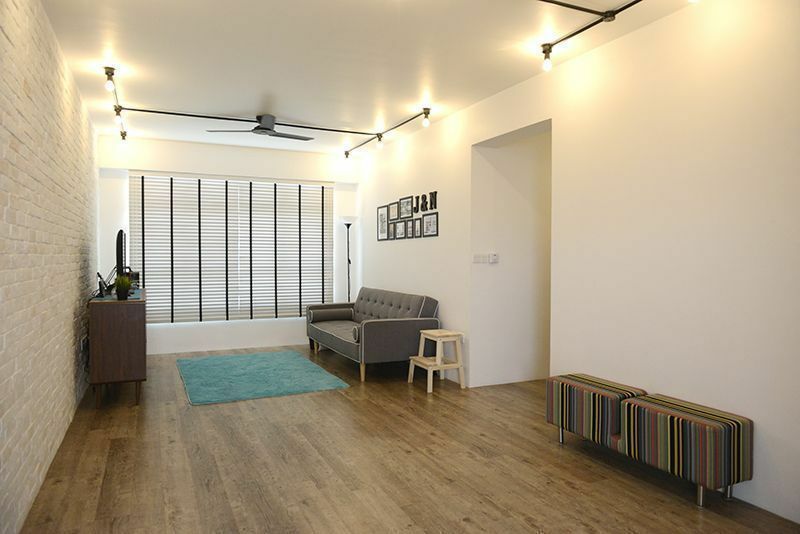 Salina's family-inspired and budget-friendly Yishun flat. Forgoing the services of an interior designer or contractor, Salina designed and decorated this three-room BTO flat with a budget of $4,000. The home also featured her DIY projects, all of them a labour of love. Cost of renovation: $4,000. 8. Jai and Noora's minimalist industrial home in Yishun. The couple kept the home simple: minimally furnished with a touch of industrial. As they didn't opt for the services of an interior designer (only a contractor), the couple took charge designing the home of their dreams. Cost of renovation: $25,000 including furniture. 9. Cynthea Lam's garden of a home in Bishan. Cynthea, who also owns Super Farmers, transformed her HDB flat into an oasis teeming with plants. What was once a "sterile" flat became a wondrous and cheerful space, thanks to the flowers and plants, most of them residing within the little kopitiam planters she makes. 10. Kaye and Justin's DIY-filled and travel-inspired four-room flat. This Scandinavian-style space gets personalised through DIY projects made by the couple and their parents: refurbished vintage cabinets salvaged, jazzed-up IKEA furniture, repainted children's chairs, among others. Decor pieces from different cities around the world are prominently displayed as well. Cost of renovation: $22,000 ($12,000 for the renovation and $10,000 for the furniture). Click here to see more of the flat. 11. Kenneth and June's Scandustrial home in Punggol. This four-room HDB flat features soft and muted elements of Nordic design, then complemented with a strong industrial look. Grey, black, and white figure prominently in this home—made warmer with the addition of wooden furnishings. Cost of renovation: $55,000 ($35,000 for the actual renovation and $20,000 for the furnishings). 12. Paul and Gloria's chic country-style home in Punggol. This couple went against the grain and created a stunning French-country style space by using beaded wainscoting on the walls, installing a faux fireplace, using pastel colours, and cabriole-legged furniture. Cost of renovation: $30,000, excluding furnishings and floor tiles. Check more Cromly house tours here.